Mix the solution. Measure 1 heaping teaspoon of salt (kosher, canning, or pickling salt) and 1/2 teaspoon baking soda into a pint container. Add 1 pint of lukewarm tap water and stir. Fill nasal irrigation cup with about 3/4 cup of the solution. Irrigate the nose. 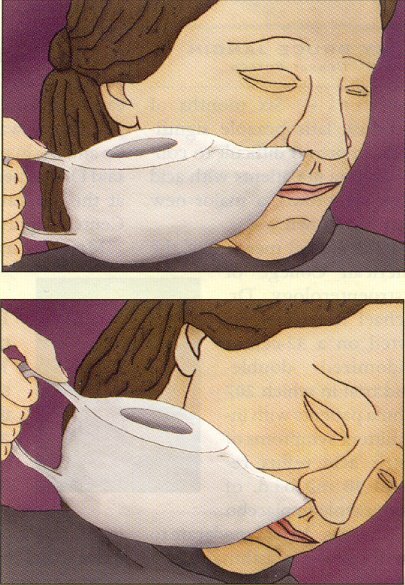 Breathe through the mouth and raise the cup's handle so that solution enters the nostril. In a few moments, solution will begin to drain from the lower nostril. When the cup is empty, exhale gently through both nostrils to clear excess solution and mucus. Gently blow nose into tissue. Repeat. Refill the nasal cup. Repeat steps 2 and 3 with the other nostril. Wash nasal cup daily. Note: Nasal irrigation cups (neti pots) are available from www .nutraceutic.com or from many local pharmacies.